A crèche, Sunday School and Kids Church are held during Sunday morning services during school term time. Our youth also gather for encouragement and bible study each Sunday morning during the 10:00am morning service. Meeting fortnightly on Thursdays during school term times, the Echunga MOPS group is a community of mums who meet to relax and unwind with good friends, good food, and good fun! Each MOPS session provides an inviting environment where women can come – just as they are – to build friendships, be encouraged, and gain practical parenting strategies. While mothers meet, children are lovingly cared for in the MOPPETS program. A typical morning includes a yummy morning tea, listening to a speaker on a topic relevant to mothers with young children, a discussion time, and a craft. New attendees are welcome to come along to MOPS any time during the year. The first session is free; subsequent sessions cost $5, which covers morning tea, craft and MOPPETS resources. Please also bring a piece of fruit for your child. 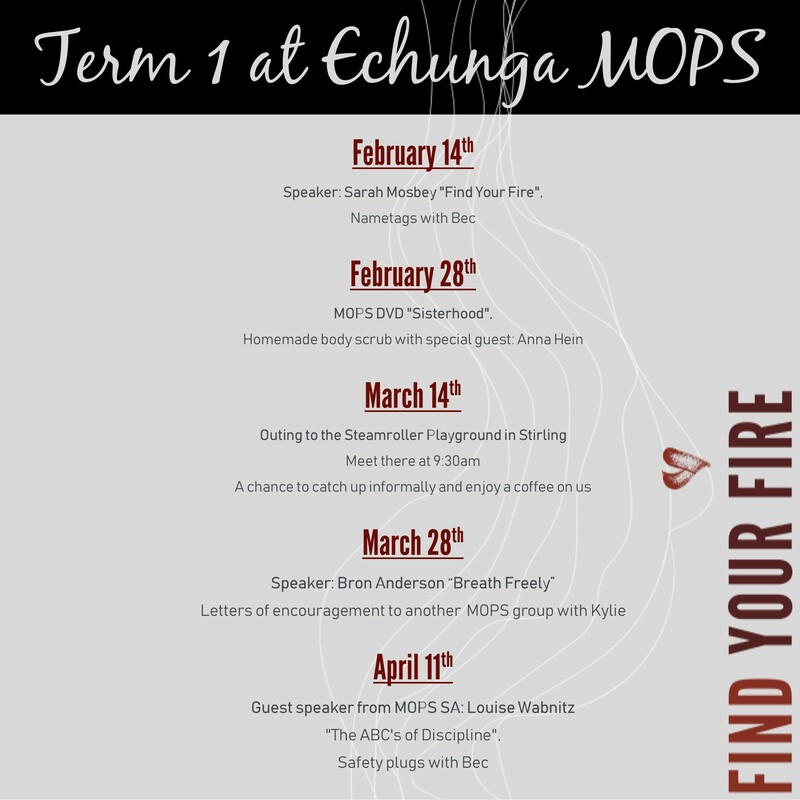 For more information about upcoming MOPS events, please visit the Echunga MOPS Facebook group page. Echunga Craft Cuppa and Cards Group meets weekly in Wandeen. Main St. Echunga. We meet each week from 1pm till 4pm approx. You’re invited to bring along your own craft or come to play cards. A small Plate of afternoon tea would be appreciated but not essential. Join us for a relaxed coffee once per month at the Echunga General Store. All are welcome. Men’s Coffee meets from 9:30am on the third Wednesday of each month. The Women’s Coffee mornings occur monthly on various dates. Small groups are a great opportunity for church members to get to know one another at a deeper level while growing in faith. Various small groups are offered both regularly and seasonally. Camps, social activities, community events and other outreach activities are held at different times during the year. Information about these will be provided in the Events Calendar and on the Echunga Uniting Church Facebook page.